Print out the Bible verse card onto card stock, write the Bible verse on the cards and make copies. Printable pattern available to members and as an instant download, above. We are special to God. He shows us we are special by providing for our needs and giving us even more than we need. Print out the picture and have your children color it. If you want to add something more than coloring, cut a frame to cover the heart frame. Have your children glue on fun foam hearts around the picture. 1. Before class print out the "God is Our Shepherd and We are His Lambs" Title page and staple it in the middle of your bulletin board. 2. 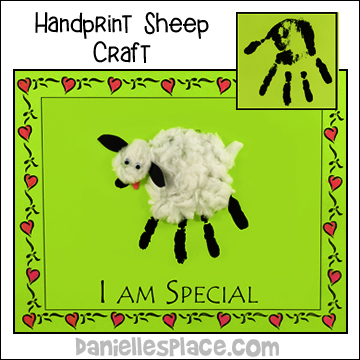 Print out the Sheep Hand Print Sheet and make copies. Printable patterns available to members and as an instant download, above. 3. In class have your children place the palm of their hands in black paint and press them on the paper so that the fingertips are facing towards the bottom of the page. The fingers are the sheep's legs and the thumb is the sheep's head. After the paint dries, let your children glue cotton balls or fiberfill onto the sheep. Staple the pictures onto the bulletin board around the title page. 1. Print out the Writing Activity Sheet and make copies. 2. 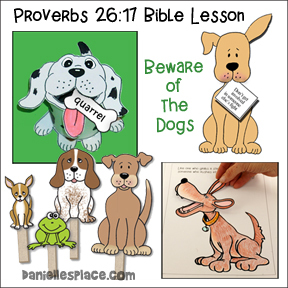 Have your older children print the Bible verse on the sheet and then color the picture. 1. Before class print out the sheep patterns onto white card stock and cut them out. 2. Print out the cup cover pattern onto bright colors of computer paper and cut them out. 3. 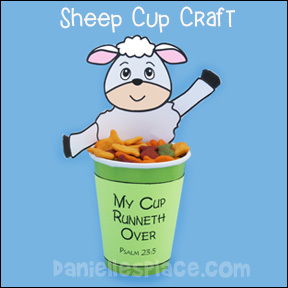 In class have your children color the sheep and tape the cup cover over the Dixie cup. 4. Tape the sheep inside the cup as shown and then let your children fill up their cups with goodies. Explain to them that the treats represent all the many things God has done for us and has given us. Each time they take out a piece of candy they should think of something that they can thank God for. 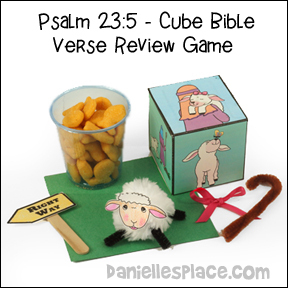 If you use this craft for the Bible Verse Review Game below, don't have your children fill them up during the opening activity. Preparation: Place a bow in Woolie's her hair and a mirror in her hand. You will also need a cup and some kind of small treats to put in the cup. Teacher: I have invited Woolie back again this week to tell us more about the Good shepherd. Woolie where are you? Woolie? Woolie, what are you doing back there. Teacher: "Woolie what were you doing? Didn't you hear me calling you?" "Oh, what is this? You have a beautiful bow on your head. 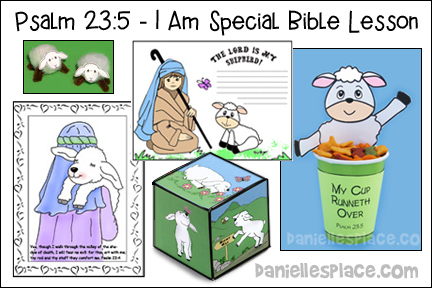 Teacher: Wow, the Good shepherd must think you are very special." As you know, we have been talking about how God is like a good shepherd. Woolie's shepherd thinks she is very special, and God, your shepherd, thinks you are very special too. He created you just the way he wanted you to be. He knew you before you were ever born. Let's read what David wrote about this. Does anyone remember where we find Psalm 23? (Have a child come up and try to find it in your Bible in your Bible.) The Bible tells us in the 23rd Psalm,"Thou preparest a table before me in the presence of my enemies. You anointest my head with oil; my cup runneth over." In Bible times when someone invited a guest to their house they would anoint them with oil. They would put special oil on their forehead to show them that they cared about them and thought they were very important. Oil was good for the skin, it kept it from getting dried out. God shows us we are special to him by providing for our needs. He not only gives us what we need, but he gives us more than we need. He wants us to be happy. When it says, "my cup runneth over" it means that he not only fills it up but gives us so much that it runs over. He fills us with his love, peace, and happiness, so much happiness that it starts running over and spreading out and reaching others. Teacher: Thank you Woolie. Woolie has put jelly beans in this cup to show how much God has blessed her. This jelly bean represents the good food she eats, and this jelly bean represents the love her shepherd showed her when he gave her the bow, and this one represents the time he rescued her when she got stuck up on a ledge. But your cup isn't quite overflowing yet. Can we help you fill this cup? Teacher: Remember that "my cup runneth over" means that God gives us more than we need because he loves us. He fills us with his blessings which make us happy. Let's think of things that God has done for us or things he has given us. I will put a jelly bean in this cup for each thing you think of. (Keep doing this until the cup begins to overflow. When the cup is filled up and overflowing tell the children that when God blesses us, we can't help but share those blessing with others. Give each of your children some of the things in the cup. Father, we thank you for being our Good Shepherd, for taking care of us and giving us what we need and giving us even more than we can even imagine. Long Strip of Blue Felt for "Still Waters"
Spread out the items in front of you in the order they will be used. As you repeat the 23rd Psalm, place each object on the table in front of you. 1. "The Lord is my shepherd" - Place the shepherd in front of you on a table. 2. "He makes me lie down in green pastures" - place the green felt in front of you and the sheep on top of the green felt. 3. "He leads me beside the still waters" - place the piece of blue felt on the green felt and move the sheep along the "still waters". 4. "He leads me in the paths of rightousness" - Place the sign in front and move the sheep in the direction it is pointing. 5. "He anoints my head with oil" - Touch the sheep's head with your finger. 6. "My cup runs over" - Hold up a cup full of water. You can put some blue material in it and spilling over it to look like water spilling. After you have gone over the whole Psalm, have your children take turns trying to do it. You can also use these props to make a movie. Assign each child a part, record each child separately and then let the children watch the movie. 1. Divide your children up into two teams. 2. Give each team a large spoon. 3. Place a bowl of marbles, packing peanuts, or anything else you might have in the front of the line in between both teams. Place a cup for each team at the opposite end of the room. 4. On the word "go" the first two children in line should scoop up some marbles onto their spoon, race down to the other end of the room and drop the marbles into their team's cup. The team who fills up their cup first and it overflows wins. 1. Print out the game cube pattern..
2. Cut out the cube pattern and tape it together. Have the children sit in a circle. The children take turns throwing the cube. 1. If the "Lord is my Shepherd" picture is facing up, the child receives a little lamb. 2. Sheep lying in green pastures, they receive a piece of green felt. 3. The "right way" picture they receive a sign. 4. The "rod and staff" they receive a staff. 5. Picture of the sheep with the bow, they receive a bow. 6. Picture with the cup, they get a treat in their cup. The children should say the verse relating to the picture each time they roll the cube. If a child rolls the same picture he has already rolled, he doesn't get another object, but gets another cookie in his cup. The child who gets all the objects first wins.